The sweaters for the girls are completed, so they got to try them on with their dresses for my brother's wedding. Of course, EJ was mostly concerned about how we would do her hair and if she would get to wear sparkly shoes (there may have been a question about jewelry too), but overall they were pretty happy to dress-up for a couple minutes so I could snap these pics. 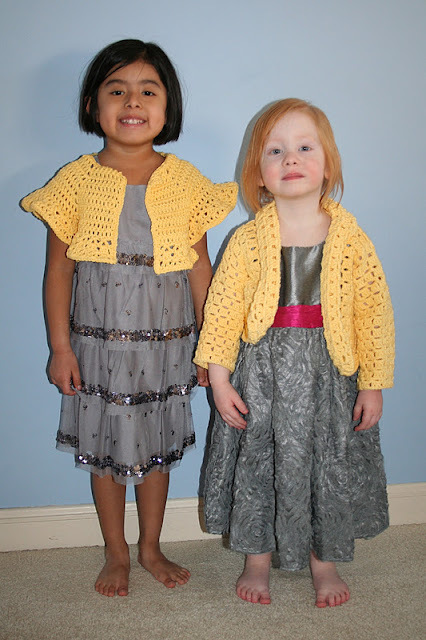 Both dresses are from Old Navy (we still need to do something about the pink band on Liv's dress) and the sweaters are done in the same yellow cotton yarn. 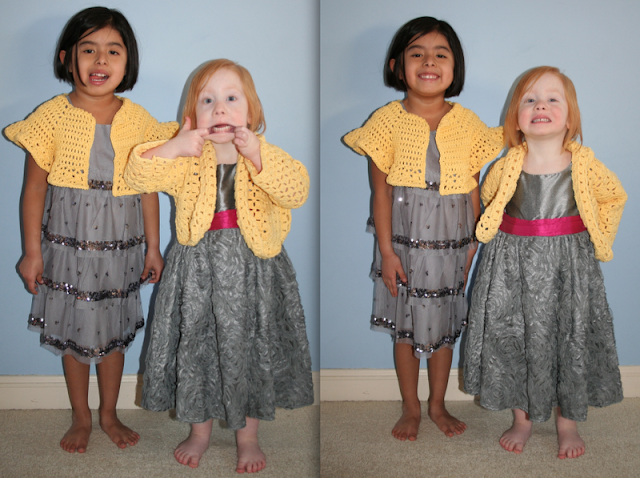 EJ's sweater is the Vera shrug and Olivia's is the Flutter Baby Top (click links for pattern info). The girls look lovely in them !!! They both look lovely and you did a great job with the shrugs. I love the silly face in picture two ... love it!!!! I am SO impressed Heather! Great job! The girls are gorgeous models too, especially that true-to-form pic of Livie making the funny face! Love it! Do you want help with Liv's band and replacing it? Ack, typo. Meant to type "EJ". Sorry! They are so sweet! Good job on their sweaters and have fun at the wedding! Gorgeous, I love the funny faces. Maia is a bit like that too at the moment- always wanting to pull faces whenever the camera is near! well done mama! so cute and pretty!! Awwww, they are adorable! Love the sweaters. The sweaters came out great! I LOVE yellow, especially when paired with grey. Also, lovely models! Oops! I totally forgot about valentine's day until now. Thanks for the great gift ideas. I don't envy you your fussy and picky eaters. My son is a pretty good eater although lately he has his moments where all he wants is mac and cheese. The sweaters are adorable. I love the yellow with the grey dresses.